Achieving literacy among girls and women remains one of the big development challenges for Afghanistan today, but also one that many believe holds the most promise. In this section, the tenth in our Oral Story Series begun in 2012, we bring you stories from illiterate women about their views on women’s rights in Afghanistan. 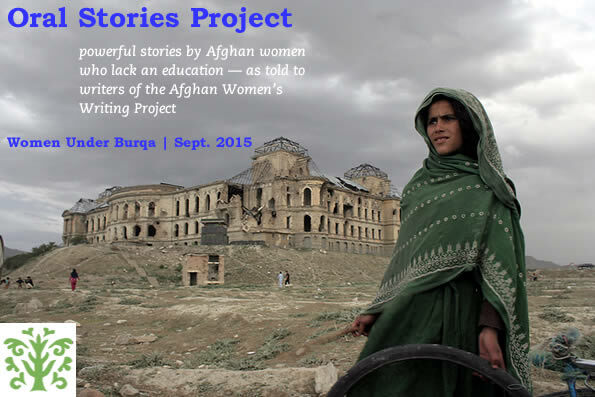 Because the women cannot write their own stories, AWWP writers in four provinces conducted interviews in August with illiterate women in Kabul, Herat, Mazar-e-Sharif, and Nangarhar. These are women whose parents denied them an education, whose husbands do not permit them to go outside alone, whose faces are covered. Our writers transcribed and translated these stories into English. All stories have been edited for clarity and length. To read more click on the links below. To read more Oral Stories by AWWP writers, click here. Founded in 2009, AWWP is staffed by dozens of volunteers and financially sponsored by donors. Please click the button to donate now. Photo: Canada in Afghanistan/Zakarya Gulistani. Graphics by Blatman Design.